To date, 75 PATI requests for have been logged by public authorities; 15 to the police, and 6 requests each to the Departments of Child & Family Services, Youth & Sports and Works & Engineering, Premier Michael Dunkley said in the House of Assembly today [Nov 27]. In introducing the Public Access to Information Amendment Bill 2015 for its second reading, the Premier said that the Public Access to Information Act 2010 came into operation on April 1st 2015. “To date some 75 requests for records have been logged by public authorities. 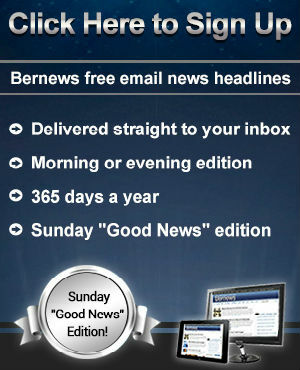 Perhaps not surprisingly, 15 of the 75 recorded requests have been directed to the Bermuda Police Service, followed by 6 requests each to the Departments of Child and Family Services, Youth and Sports and Works and Engineering. “Five requests for records have been made to the Cabinet Office. Other public authorities have received one or more requests. “For the sake of accuracy I wish to point out that the 75 requests which I mentioned reflect requests made to public authorities which utilize the tracking system supplied by the Government. “When the 2014 amendments were debated in this Honourable House, implementation of PATI has been continuously assessed and monitored,” added the Premier. “As a result of that exercise, the proposed amendments to the Act and the Public Access to Information Regulations 2014 [the Regulations] have been recommended to further streamline administrative processes and clarify certain exemptions. Premier Dunkley provided an analysis of the provisions, saying “an amendment to the Act is proposed to exempt from the application of the Act all records held by the units of the Justice Protection Programme which was established by the Justice Protection Act 2010 to protect witnesses and certain other persons. The Premier also said that clause 4 of the Bill amends the Act so that a requester can be granted access to a record as soon as it is reasonably practicable to do so, clause 5 amends the Act to prohibit the disclosure of information about the position and functions of police officers engaged in surveillance functions in order to maintain their safety, clause 6 amends the Schedule to include the Office of the Parliamentary Registrar as a public authority. In addition, clause 8 of the Bill makes provision for the following amendments to the fee structure: one fee [$1.00] to be charged for a photocopy of a record with no distinction between colour and black/ white copies; the requester to be charged a fee for the actual cost of digital storage apparatus incurred by the public authority where the request is for a digital record; the fee for conversion of a paper record or digital text file is revised so that it is based on actual costs incurred by the public authority; and removal of fees for searches of registers or indexes. 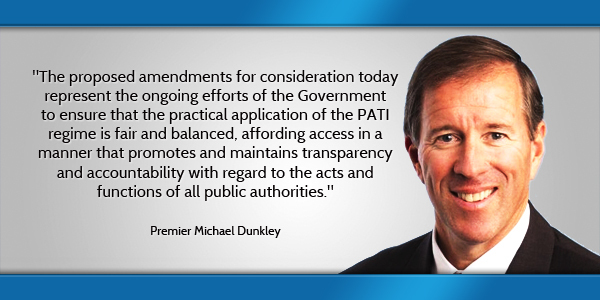 “The proposed amendments for consideration today represent the ongoing efforts of the Government to ensure that the practical application of the PATI regime is fair and balanced, affording access in a manner that promotes and maintains transparency and accountability with regard to the acts and functions of all public authorities,” added the Premier. Mr. Speaker and Honourable Members, I am pleased to rise before this Honourable House to introduce the Public Access to Information Amendment Bill 2015 [the Bill] for second reading. Mr. Speaker, Honourable Members will recall that the Public Access to Information Act 2010 came into operation on April 1st 2015. The enactment of this legislation has afforded members of the public who are Bermudian or resident in Bermuda access to records held by public authorities which include Government departments and entities such as Bermuda College, Bermuda Hospitals Board, Bermuda Tourism Authority, Bermuda Land Development Corporation and West End Development Corporation. Mr. Speaker, I am pleased to inform this Honourable House that the public access to information [PATI] regime has been successfully implemented – information officers have been appointed and trained to discharge their statutory responsibilities by the Central Policy Unit [CPU] PATI Implementation team. In addition, Bermuda’s first Information Commissioner, Gitanjali Gutierrez has instituted measures to raise public awareness and understanding of PATI so that members of the public are well-informed of their rights and the process by which access to information can be obtained. Mr. Speaker, to date some 75 requests for records have been logged by public authorities. Perhaps not surprisingly, 15 of the 75 recorded requests have been directed to the Bermuda Police Service, followed by 6 requests each to the Departments of Child and Family Services, Youth and Sports and Works and Engineering. Five requests for records have been made to the Cabinet Office. Other public authorities have received one or more requests. Based on these statistics, it is evident that the public is embracing its right to request records under the PATI regime. Mr. Speaker, for the sake of accuracy I wish to point out that the 75 requests which I mentioned reflect requests made to public authorities which utilize the tracking system supplied by the Government. The number does not include requests made to quangos or other public authorities which collect and record their own statistics. However, the total number of requests made to all public authorities will be included in the annual report by the Information Commissioner which is required to be laid before each House of the Legislature. Mr. Speaker, implementation has not been without its challenges as public authorities make the necessary administrative modifications to their operations to ensure compliance with the statutory requirements of the PATI regime. However, as promised when the 2014 amendments were debated in this Honourable House, implementation of PATI has been continuously assessed and monitored. As a result of that exercise, the proposed amendments to the Act and the Public Access to Information Regulations 2014 [the Regulations] have been recommended to further streamline administrative processes and clarify certain exemptions. To assist Honourable Members with their consideration of the amendments, I will provide an analysis of the provisions in the order that they appear in the Bill. Mr. Speaker, an amendment to the Act is proposed to exempt from the application of the Act all records held by the units of the Justice Protection Programme which was established by the Justice Protection Act 2010 to protect witnesses and certain other persons. The amendment in clause 2 of the Bill will ensure that no record containing information about a protected person can be disclosed under the Act. Mr. Speaker, section 6 of the Act requires public authorities to provide information to the public at regular intervals. Public authorities must also keep a log of all access requests made under section 13 of the Act. The information in the log excludes the name of requesters, any other information that could reveal the identity of the requester, and personal information. Section 6 provides that the log shall be made available to members of the public upon request “together with any information that has been provided pursuant to an access request that has been granted.” As presently drafted, the requirement to produce the information contained in the log may be construed as requiring the public authority to produce any or all records disclosed even where the record contains exempt information that would not otherwise be disclosed to a person other than the requestor. Consequently, Clause 3 of the Bill amends section 6 of the Act to clarify this requirement. Mr. Speaker, currently under section 14 of the Act, the information officer has six weeks to process a request for access after receipt. Where a decision has been made within this period to grant access to a record, applying a literal interpretation, the record cannot be released until the expiry of a further period of six weeks, during which a requester or third party can make an application for a review of the decision. The effect of this provision is that a requester could conceivably not be granted access to a record until expiration of twelve weeks from receipt of the request. In cases where the information is easily accessible, is not personal information and the request does not relate to information concerning a third party, this period is excessive and contrary to the underlying principle to afford access to records in a timely manner pursuant to section 12[b] of the Act. Therefore, clause 4 of the Bill amends section 14 of the Act so that a requester can be granted access to a record as soon as it is reasonably practicable to do so. Mr. Speaker, under the Act, a record that consists of personal information is exempt from disclosure. However, under section 24[a] of the Act, the definition of “personal information” does not include “information about an individual who is or was an officer or employee of a public authority that relates to the position or functions of the individual”. To the extent that this information can be requested and may be disclosed, Bermuda Police Service [BPS] is concerned that officers of the BPS and the organization itself may be put at risk. For example, a PATI request on the posting or function of an officer engaged in surveillance would expose Police operations and/or put national security at risk. Consequently, clause 5 of the Bill amends section 24 of the Act to prohibit the disclosure of information about the position and functions of officers of BPS engaged in surveillance functions in order to maintain their safety. Mr. Speaker, no reference is made in any part of the Act, and in particular, in the Schedule, to the Office of the Parliamentary Registrar. Therefore, clause 6 of the Bill amends the Schedule to include the Office of the Parliamentary Registrar as a public authority. Additionally, clause 6 amendments to the Schedule include substituting the Chairman of the Public Service Commission and the Executive Officer as the Head of Public Authority for the Public Service Commission and the Human Rights Commission respectively to correctly reflect their role and responsibilities within these entities. Mr. Speaker, the information officer of a public authority is required under regulation 20 of the Regulations to keep a register of applications in electronic form “in the monitoring and tracking computer system used by the Government”. The tracking system that has been developed by ITO gives public authorities outside Government, such as BLDC and WEDCO access to the system. Clause 7 of the Bill amends regulation 20 to remove the mandatory requirement for the external public authorities to use the Government system to monitor and track requests so that its use is optional. These entities may elect to use a spread sheet or an electronic system that they have developed for this purpose. Mr. Speaker, in keeping with the spirit of PATI, a fee structure was created that would not be viewed as a barrier to access. The proposed amendments in clause 8 of the Bill aim to ensure that the fees imposed are commensurate with the effort expended to process a request; and remove fees for searches of registers or indexes. Removal of fees for searches of registers or indexes. Mr. Speaker, with the implementation of PATI, public authorities have begun the transition to becoming more transparent and accountable organizations through the proactive and consistent release of information within the parameters of the Act. The impact of administering the PATI regime on the resources of public authorities continues to be monitored and, thus far, the efficient operation of public authorities has not been compromised. Public authorities, particularly information officers, are to be commended for diligently undertaking the appropriate measures necessary to facilitate their compliance with the Act. In conclusion Mr. Speaker, the proposed amendments for consideration today represent the ongoing efforts of the Government to ensure that the practical application of the PATI regime is fair and balanced, affording access in a manner that promotes and maintains transparency and accountability with regard to the acts and functions of all public authorities.